Drop the protractor! 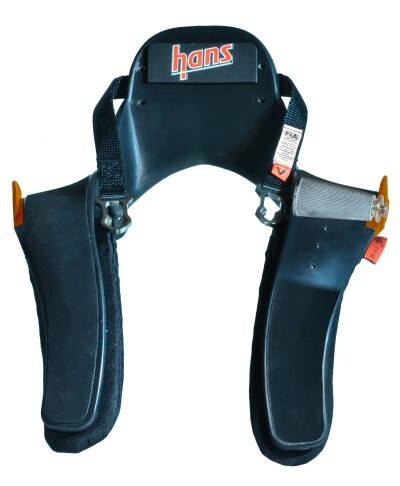 The new HANS Adjustable can quickly and easily be changed from 10 degrees to 40 degrees inclination in increments of 5 degrees. Perfect for drivers who race more than one type of vehicle. The adjustment is so quick and easy, you can do it between sessions. Weighs just over 2 pounds (970 g). 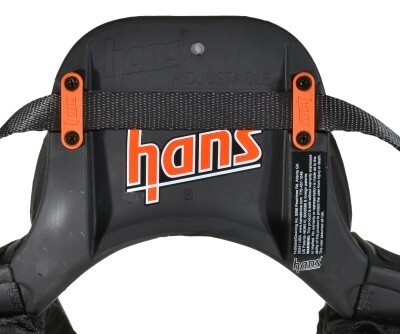 That's less than the Sport model HANS Device! SFI 38.1 approved. 10 Degrees: For extremely upright seats (sprint cars) or very thin drivers in sedans. 15 Degrees: For larger drivers in upright seats, or thin drivers in sedans. 20 Degrees: For medium-build drivers in sedans. 25 Degrees: For slightly larger drivers in sedans, or very thin drivers in formula cars. 30 Degrees: For medium-build drivers in most formula cars, or larger drivers in sedans. 35 Degrees: For larger drivers in formula cars, or drivers in some vintage formula cars. 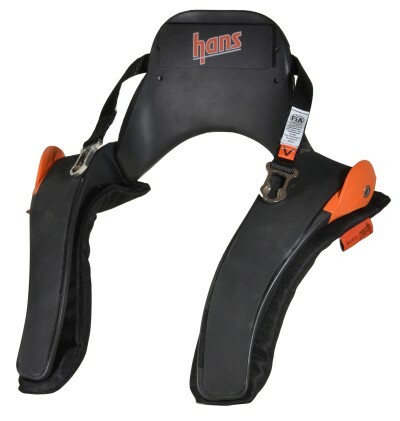 Includes Adjustable HANS Head and Neck Restraint Device with Vision Advantage Plus sliding tethers. 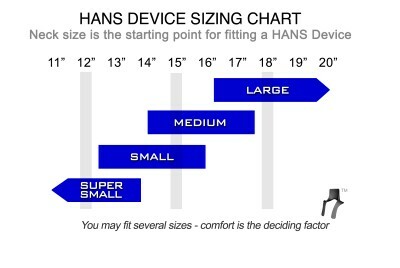 To determine the correct size, measure your neck and follow the chart below. 14" to 17" 16" to 20"
* Drivers with highly developed neck and trapezuis muscles may require one size larger than their neck size alone would indicate. anchors. What do I do? If your helmet manufacturer has followed the FIA 8858-2002 or 8858-2010 standard, or if they have followed our Helmet Anchor Installation guidelines, all you need to do is go ahead and use the pre-drilled holes. There’s a ridge or air vent preventing me from following your Helmet Anchor Installation guidelines. What do I do? Sometime anchor location positions have to be adjusted to suit helmet features such as ridges, air vents, etc. In these situations, locating the hole up to 1" rearward, or 1/4” up, down or forward is satisfactory. It is very important that the holes are positioned symmetrically, so if you move the location point on one side, do the same for the other. If in doubt, call us. Where do I find the FIA information? 712 points will be rewarded to you when you buy this item.